The 2014 Nobel Laureates will be announced next week. I hope you will consider amplifying the news via social media, op-eds and letters to the editor. The Nobel prize is so iconic that it provides an entrée to the broader public, one that can be used to connect the dots between the process of scientific discovery, the power of ingenuity, and the role of science in human progress. And if a winner has been funded by a U.S. science agency or company, all the better from an advocacy perspective! 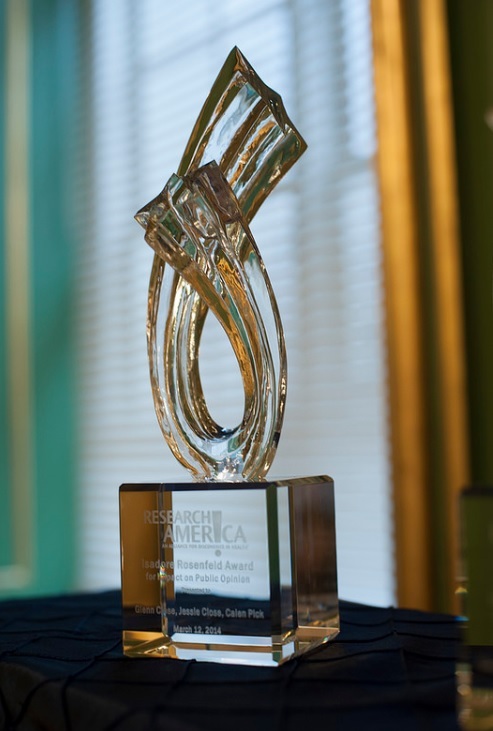 ALEXANDRIA, Va.—September 29, 2014—Research!America’s 19th annual Advocacy Awards will honor distinguished research advocates who are trailblazers in advancing medical progress to improve the health and economic security of our nation. The event will take place on Wednesday, March 11, 2015, at the Andrew W. Mellon Auditorium in Washington, DC. 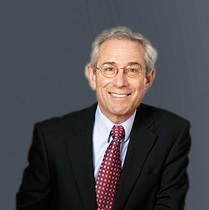 Excerpt of a blog post by Dr. Tom Insel, Director of the National Institute of Mental Health. The Research!America awards dinner is like a lot of DC galas, complete with members of Congress, celebrities, and speeches to honor those who have contributed to a cause. For Research!America, the cause is biomedical research and this year, as in each of the past 25 years, there were honors bestowed on advocates for cancer and rare diseases. Kathy Giusti, diagnosed with multiple myeloma in 1998, spoke passionately about the lack of research on this blood cancer and her singular fight to create a registry and clinical trials, leading to new treatments that have extended her own life and the lives of many others well beyond all predictions. The parents of Sam Berns, an icon for the rare disease progeria, spoke of their son’s commitment to find a cure for this disorder in which children age rapidly and die early. Sam died last month at age 17, but during his brief life, and partly through his efforts working with the world’s foremost genetics labs, the genetic cause was found and new treatments were developed that will almost certainly extend life for others with this rare mutation (see Sam’s inspirational Ted talk ). For me, what made this event different from previous years was the recognition of advocates for people with mental illness. The actress Glenn Close was recognized for co-founding BringChange2Mind, a campaign to reduce negative attitudes toward those with mental illness. In her eloquent remarks accepting the award, Glenn introduced her sister, Jessie Close, and her nephew, Calen Pick, who each battle serious mental illness. Jessie has struggled with bipolar disorder and Calen with schizophrenia. When Glenn invited Jessie and Calen to make a few remarks, the evening really became historic. Together, they described a journey undertaken with Deborah Levy and her colleagues at McLean Hospital and elsewhere over the past 3 years. The research team found that Calen and Jessie shared a rare genomic copy number variant resulting in extra copies of the gene for glycine decarboxylase. This gene encodes the enzyme that degrades glycine, a key modulator of the NMDA receptor, which has been implicated in psychosis. Having extra copies of this gene, it seemed possible that Jessie and Calen would be deficient in glycine, with less activity of the NMDA receptor. 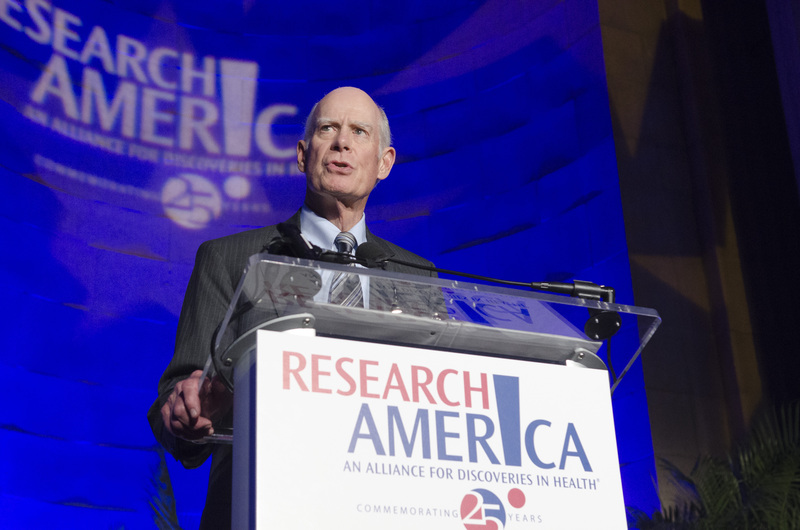 On March 12, Research!America honored extraordinary leaders in medical and health research advocacy during the 2014 Annual Advocacy Awards at the Andrew W. Mellon Auditorium in Washington, DC. We extend our congratulations to the honorees: Reps. Frank Wolf (R-VA) and Chaka Fattah (D-PA); actress Glenn Close and her family for their work to end the stigmas and misunderstandings surrounding mental illness; Leroy Hood, MD, PhD, president of the Institute for Systems Biology; Kathy Giusti, founder and CEO of the Multiple Myeloma Research Foundation (MMRF); Reed Tuckson, MD, managing director of Tuckson Health Connections; and The Progeria Research Foundation (PRF). While much has been done to advance research, we have a long way to go. And we agree! Contact your representatives and tell them to make research funding a higher priority. Distinguished guests included current and former members of Congress and administration officials. Sen. Angus King (I-ME), Rep. David Price (D-NC), Rep. Nita Lowey (D-NY) and Rep. Scott Peters (D-CA), joined the celebration. Research!America board members, The Hon. Mike Castle, The Hon. Kweisi Mfume and The Hon. Patrick Kennedy also attended the event along with former Congresswoman Mary Bono , former HHS Secretary The Hon. Dr. Louis Sullivan, NIH Director Dr. Francis Collins, NSF Acting Director Dr. Cora Marrett, and PCORI Executive Director Dr. Joe Selby. 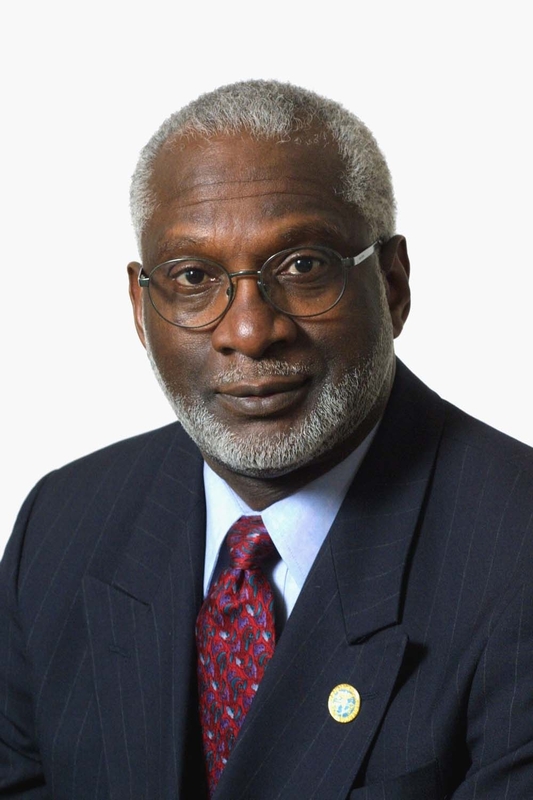 Excerpt of an op-ed by David Satcher, MD, PhD, honorary chairman of the African American Network Against Alzheimer’s, former U.S. surgeon general and Research!America’s 2007 Raymond and Beverly Sackler Award for Sustained National Leadership award winner, published in The Washington Post. Every February our society measures its progress in the march toward equality as part of Black History Month. But seldom do we discuss inequality in health, an injustice that continues to plague African Americans. A whole host of health disparities remains unaddressed, including Alz­heimer’s — a disease that African Americans are two to three times more likely to develop than non-Hispanic whites. This disparity is rooted as much in our cultural heritage as in our genes. For years, studies have found that African Americans have a profound mistrust of doctors and scientists. Consequently, we participate in clinical trials at far lower rates than other ethnic groups, which helps to perpetuate the sort of disparities seen with diseases such as Alzheimer’s. This fear of clinical trials dates to a dark chapter in our shared history: the Tuskegee syphilis experiments. The Tuskegee study was an infamous clinical experiment in which researchers and the U.S. Public Health Service led African American men with syphilis to believe that they were receiving free medical care while, unbeknown to them, they were being left untreated so scientists could study the effects of prolonged syphilis. After the Associated Press exposed the truth, sparking a public outcry, the U.S. government ended the study in 1972, 40 years after it began. The 1974 National Research Act set new guidelines for the use of humans in clinical studies. In 1997, the Clinton administration worked with higher education institutions to usher in new training requirements and ethical standards for physicians, researchers and medical students as part of an official apology President Bill Clinton issued on behalf of the nation to the victims of the experiments. While these standards go a long way toward helping to prevent future such experiments, much damage was already done among African Americans. Ironically, the government is closed down today. But that’s due to a major snowstorm, not because of failure to agree on increasing the debt limit! Agreeing to increase the debt limit is an encouraging sign that this Congress, weighed down as it is by ideological and political differences, and with record- low approval rankings from the public, can get its job done! Our job is to be sure research is a top priority in this election year — spoken of with conviction by all candidates and by the media and others who influence them. Standing tall among Members of Congress who champion science are the Chair and Ranking Member of the House Appropriations’ Commerce, Justice, Science and Related Agencies subcommittee, Rep. Frank R. Wolf (R-VA-10) and Rep. Chaka Fattah (D-PA-02). At our upcoming March 12 Advocacy Awards dinner, Research!America will honor Reps. Wolf and Fattah with the Edwin C. Whitehead Award for Medical Research Advocacy, saluting their tireless efforts to champion policies that promote federal and private sector medical research and innovation. Be sure to join us! Robert Samuelson observes in The Washington Post that Congress, whether by action or inaction, is making too many decisions “on the sly,” without real public awareness or comprehension. Samuelson says that in so doing Congress is compromising priorities like defense and medical research while simultaneously failing to address tax and entitlement reform. I think it is telling that he chose to identify the loss of purchasing power by the NIH as one of three critical problems created as our elected representatives fail to find a clear path through the ideological storm. One of these days they will make those major decisions, and that’s when it will pay off that research has been well-positioned as a top national priority. We must continue to make the case and make it forcefully. Strong arguments for changing course by Dr. Claire Pomeroy, president of the Albert and Mary Lasker Foundation in The Huffington Post. Updated facts on science and research in the U.S.: National Science Board Science and Engineering Indicators 2014. Creative, unique short videos demonstrating the importance of federal investments in biomedical and biological science from the winners of FASEB’s second Stand Up for Science Video Competition. And this: According to the National Retail Federation, Americans are expected to spend $17.3 billion in celebration of Valentine’s Day. That amount would fund the National Heart, Lung and Blood Institute for more than five years! We are a wealthy nation; we can well afford to spend more on the future of health than we currently are. Just in time for the World Series, a national campaign to make evidence-based government spending decisions has been announced. Moneyball for Government, a project of Results for America, advocates prioritizing limited taxpayer dollars by investing strategically in what works, eschewing “gut level” instinct for metrics-driven decision-making. Stakeholders in medical and health research sometimes have difficulty measuring or agreeing on metrics that matter; it’s time to work through this challenge so that when stakeholders talk about research accountability — in the current budget conversations or in any context — we can speak with one metric-driven voice to emphasize the returns on research investment in both lives and money saved. ALEXANDRIA, Va.-October 22, 2013-Research!America’s 18th annual Advocacy Awards will honor extraordinary advocates of medical and health research who are distinguished in their commitment to advancing medicine and health. The event will take place on Wednesday, March 12, 2014, at the Andrew W. Mellon Auditorium in Washington, DC, as a part of Research!America’s 25th anniversary commemoration. The 2014 Advocacy Award winners are actress Glenn Close and her family; Leroy Hood, MD, PhD, president, Institute for Systems Biology; Kathy Guisti, founder and CEO of the Multiple Myeloma Research Foundation (MMRF); Reed Tuckson, MD, managing director, Tuckson Health Connections; and The Progeria Research Foundation (PRF). The winner of the Edwin C. Whitehead Award for Medical Research Advocacy will be named by Research!America’s Board of Directors later this year. President Obama spoke to the National Academies of Science on Monday. I commend his remarks to you. He charged the members of the Academy, and by extension the science community writ large, to engage at “the center and the heart of our public debate.” He said that IF scientists do so, the nation will be assured of continued prominence. IF is a tall order — it makes most scientists very uncomfortable, but it is essential that we get out of our comfort zone right now. The president didn’t pound his fist on the podium in stressing this, so I will. The science community simply cannot step away from the public and political fray right now; not if we want to see the end of sequestration and not if we want to hear no more talk, such as has become more serious this week, of upending peer review. Draft legislation from Rep. Lamar Smith (R-TX), chair of the House Science Committee, would do just that. The bill in its current form would require the NSF director to certify that all grants meet certain criteria before providing funding for a project, effectively adding another layer of review for research projects and overriding current NSF guidelines. The committee has released a statement on the proposed legislation. You can view the legislation here and send your feedback to the committee using this link. We continue to beat the drum in the media about the foolishness of sequestration, including in a Marketplace radio broadcast on NPR stations. Also this week on NPR, an interview with NIH Director Dr. Francis Collins highlighted sequestration’s impact on medical research and the challenging career pathway for young scientists. This is the time to accept the president’s charge and join in at the heart and center of the public dialogue — make a point, today, of reaching out to local media. Sequestration is going to stay in the news for awhile; science will not be part of the story unless the advocacy community speaks out. Many of you have attended our annual Advocacy Awards dinner held in March each year. We are fast approaching the deadline for nominations for our next Advocacy Awards, which will mark our 25th anniversary celebration! Please take a moment to browse the categories and nominate an individual, or an organization, who should be recognized for outstanding advocacy. There are no Nobel Prizes for advocates; recognition by the Research!America alliance is the next best thing! Contact Barbara Love with any questions about the nominations process. Next Thursday, May 9, Research!America is co-sponsoring a discussion on healthy aging across the lifespan. The event will feature a variety of speakers including Susan Dentzer, a Research!America Board member. I hope you can join us! You can find more information and RSVP here. Every year, Research!America honors outstanding biomedical and health research advocates from a variety of fields. We are currently accepting nominations for our 25th Anniversary Advocacy Awards. Through these awards, Research!America recognizes individuals and organizations whose leadership efforts have been notably effective in advancing our nation’s commitment to research. The nomination process is simple and the deadline is May 15. There are multiple categories, including individual and organization awards. Past winners include CNN Chief Medical Correspondent Sanjay Gupta, MD, patient advocate John Crowley, Chair and CEO, Amicus Therapeutics, Bob Woodruff, the March of Dimes and the late C. Everett Koop. You can read about the 2013 Advocacy Awards on our blog and view information about other past award winners on our website. The 2014 Advocacy Awards will be held in Washington, D.C. on March 12, 2014. Now available online, Research!America’s Annual Report, “Reasons for Research,” recounts the progress made in research advocacy by Research!America and its members representing academia, industry, scientific societies, patient groups and foundations. In addition to highlighting the 2012 Advocacy Awardees and Garfield Economic Impact Awardees, the report details Research!America initiatives such as the ongoing Save Research campaign and the Your Candidates–Your Health national voter education initiative. The annual report also includes polling data, statements from speakers at the National Health Research Forum — including the heads of the federal health agencies — and other Research!America activities in collaboration with members and partners. The theme for this year’s report, Reasons for Research, is reflected in a new webpage on Research!America’s website. Here you can read testimonials of patients and young scientists highlighting their reasons for research. Without continued advocacy and support for biomedical and health research, these young scientists may not be able to pursue their passion: investigating cures and treatments for patients like those featured on this webpage. Research!America extends our congratulations again to all of our 2013 Advocacy Award winners. The dinner was a wonderful opportunity to thank our supporters and advocates for all of their hard work and recognize leaders in the research and advocacy communities. This year’s Advocacy Award winners were Sen. Richard Burr (R-NC); Sen. Bob Casey (D-PA); John F. Crowley, patient advocate and chairman and CEO of Amicus Therapeutics, Inc.; Mark Rosenberg, MD, president and CEO of The Task Force for Global Health; John Mendelsohn, MD, director of the Khalifa Institute for Personalized Cancer Therapy and former president at The University of Texas MD Anderson Cancer Center; Diane Rehm, host of “The Diane Rehm Show” on NPR; and the California Institute for Regenerative Medicine. You can read more about the awards and speech by Research!America Chair John Porter in this Roll Call article, in this article about Dr. Rosenberg’s award, and on CIRM’s blog. Also, visit our Facebook page and website to see photos from the awards dinner. While we applaud our awardees for their efforts, there is still more to be done! As Research!America President and CEO Mary Woolley said in her recent weekly advocacy message, Congress is working on the budget for FY14 and there is still time to contact your representatives and tell them to make research funding a higher priority. A Weekly Advocacy Message from Mary Woolley: Will Policy Makers let Rome Burn? Today, the Senate is planning to vote on a bipartisan continuing resolution from Sens. Mikulski and Shelby to fund the federal government through the end of the year. The good news is that the bill includes an increase, albeit small ($71 million) in NIH funding; Senator Harkin tried, unsuccessfully, unfortunately, to increase NIH even further, and Senator Durbin worked on an ambitious amendment to add more than $1.5 billion to the NIH budget. We truly appreciate the efforts of all of these champions and the fact that NIH funding was singled out for an increase on a bipartisan basis by the Appropriations Committee. The bad news is that sequestration will wipe out all of these increases. The most likely outcome of the Senate appropriations process is a cut to NIH in the $1.5 billion range. While our community’s herculean advocacy efforts over the last several months are paying off — medical research funding is clearly receiving priority consideration — sequestration is sweeping away our progress. We must continue to fight this policy mistake, with its 10 years of consequences. Take a minute right now to speak out to your representatives. And plan, on April 8, to join the research community at a Rally in D.C. to fight for medical research. Learn more here. Another amendment offered to the Senate legislation would eliminate political science research at NSF by transferring those dollars to the National Cancer Institute. This amendment sets a dangerous precedent that threatens the integrity and value of research. For years, leaders in Congress from both sides of the aisle, including Research!America’s chairman, former Congressman John Porter, have fought off attempts by Congress to micromanage research. We must fight to keep research decisions off the House and Senate floors and in the hands of scientists and patients. The House and Senate budget resolutions for FY14, which were also introduced this week, are emblematic of the problem we, as a country, face. The ideological divide is so great that “a grand bargain,” one that will balance the federal budget without decimating our economy and forsaking our determination to defeat disabling and deadly diseases, seems impossible. But Congress and the White House report to the American people. We can and must demand compromise between competing views of the government’s role, and we must stand up for priorities like fighting diseases that threaten our own and future generations. No more political party posturing usurping the governing process. No more across-the-board cuts. FY14 must bring with it pragmatism, prioritization and policy making that puts the country first. Norm Ornstein, resident scholar at the American Enterprise Institute, has penned a compelling op-ed in Roll Call capturing these sentiments. Switching gears in this very big week, I’d like to thank all who were able to join us for yesterday’s Annual Meeting and Advocacy Awards dinner. We heard truly inspirational remarks from Sens. Richard Burr and Bob Casey, champions of the entire ecosystem behind U.S.-driven medical progress. Our other award winners — John Crowley, Diane Rehm, Dr. John Mendelsohn, Dr. Mark Rosenberg and the California Institute for Regenerative Medicine — are strong advocates for research; we salute their achievements. Finally, as I announced at our Board meeting, I’m proud that Research!America has entered into a letter of agreement with our sister organizations in Australia, Canada and Sweden to ensure international collaboration by sharing best practices in advocacy for research for health. While our organizations operate in different countries and in distinctly different political environments, we have in common a fundamental commitment to making biomedical and health research a higher global priority. Research!America’s Advocacy Awards are tonight! Research!America will honor extraordinary leaders in biomedical and health research advocacy at the 17th Annual Advocacy Awards tonight, March 13, at the Andrew W. Mellon Auditorium in Washington, DC. This year’s Advocacy Award Winners are: Sens. Richard Burr (R-NC) and Bob Casey (D-PA); Diane Rehm, author and host of WAMU 88.5 and NPR’s “The Diane Rehm Show”; John F. Crowley, patient advocate, inspirational entrepreneur, and chairman and CEO of Amicus Therapeutics, Inc.; John Mendelsohn, MD, director, Khalifa Institute for Personalized Cancer Therapy and former president of The University of Texas MD Anderson Cancer Center; Mark Rosenberg, MD, president and CEO, The Task Force for Global Health; and the California Institute for Regenerative Medicine (CIRM). Follow Research!America on Twitter (@researchamerica) and visit our Facebook page to get more information about tonight’s event. Look for photos of the Awards Dinner on our Flickr account and video clips on our YouTube page in the coming days. For more information about the honorees, visit www.researchamerica.org/advocacy_awards and read our latest press release. You can also follow news updates from our honorees. Read Senator Burr’s blog and news from Senator Casey; visit The Diane Rehm Show’s Facebook page; don’t miss the Crowley family’s website and Amicus Therapeutics news; keep up with news about Mendelsohn and the Institute for Personalized Cancer Therapy; Rosenberg and the Task Force for Global Health’s online news room is full of great information; and don’t miss CIRM’s blog. Yesterday, the House passed a budget for the remainder of the fiscal year that includes this year’s cuts from sequestration along with an additional one percent across-the-board cut. The bill now heads to the Senate for consideration, where we are likely to see higher funding levels than the House version, but with sequestration still in place. Congress seems anxious to avoid the brinksmanship and the government shutdown threats that have characterized past debates. While the less rancorous environment surrounding the CR is a welcome change, the complacency around sequestration is not. As research advocates, we cannot let these cuts stand. Sequestration isn’t a one-year cut, it is ten years worth of cuts, none of which are evidence-based. We may be looking at the early stages of an elusive “grand bargain” as the president meets with Republican senators to discuss tax and entitlement reform – two key pieces for solving the deficit puzzle. Eliminating sequestration must be part of that bargain. In addition, we must ensure that funding for biomedical and health research, including the resources FDA needs to do its job, are assigned a high priority in fiscal year 2014. That should be reflected in the budget resolution and obviously in the FY 2014 funding bill. None of this will be easy. Working together, advocates have raised the profile of medical research with policymakers and the media. We need to turn the volume up louder yet on it, while cultivating more champions in Congress. Continuing to engage the media is part of that equation. Some of the largest news outlets in the country including Fox News, NBC, and CBS, and a number that are new to our issue including Al Jazeera quoted Research!America when writing about sequestration’s impact on science. The Economist published a thoughtful piece about how cutting American health research will harm the world. Industry is adding its voice with an op-ed in Forbes coauthored by three legendary executives, including Research!America board member and former NIH director, Dr. Elias Zerhouni, Marc Tessier-Lavigne of The Rockefeller University and P. Roy Vagelos, Chairman of Regeneron Pharmaceuticals. I also want to highlight a letter that Dr. Herb Pardes, Executive Vice Chairman at New York Presbyterian and Research!America board member, sent to the President. He captures the very themes that will anchor our advocacy going forward. At the same time as policymakers were cutting federally funded research dollars, researchers were delivering another astonishing breakthrough – the real possibility of a functional cure for HIV. This remarkable achievement, bringing us a step closer to a world free from the scourge of HIV/AIDS, would not have been possible were it not for NIH funding that supported the research and development of anti-retroviral drugs. The CDC is also in the news, with troubling warnings about the spread of “nightmare bacteria” – germs that can be deadly because they are resistant to traditional medicines. As CDC works to track and halt the spread of these germs and fulfill the numerous other public health functions for which they are responsible, the agency is not only contending with sequestration. Over the past several years, CDC has been subject to some of the deepest cuts of any health agency. Our Nation is fast approaching a tipping point. Are public health and safety and the progress borne of medical innovation priorities, or not? As many of you already know our annual events are coming up next week! Please join us for the Annual Meeting (free of charge to members) to hear remarks from Rep. Joe Kennedy (D-MA), a freshman member of Congress who is already championing research, and also John Crowley, CEO of Amicus Therapeutics. I hope to see you all at our Annual Advocacy Awards Dinner later that evening – seats are selling fast, but still available.